This PDF 1.3 document has been generated by Pages / Mac OS X 10.12.6 Quartz PDFContext, and has been sent on pdf-archive.com on 16/08/2017 at 01:42, from IP address 73.209.x.x. The current document download page has been viewed 83 times. evening playing with your kids on the trampoline. 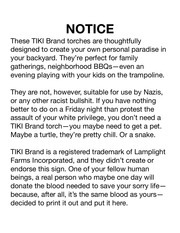 TIKI Brand torch—you maybe need to get a pet. Maybe a turtle, they’re pretty chill. Or a snake. decided to print it out and put it here. This file has been shared by a user of PDF Archive. Document ID: 00647701.